Hotel “Lavilia” – is a sophistication and comfort of European lifestyle, beauty and hospitality of Ukrainian culture, where most discriminating guests will be satisfied! 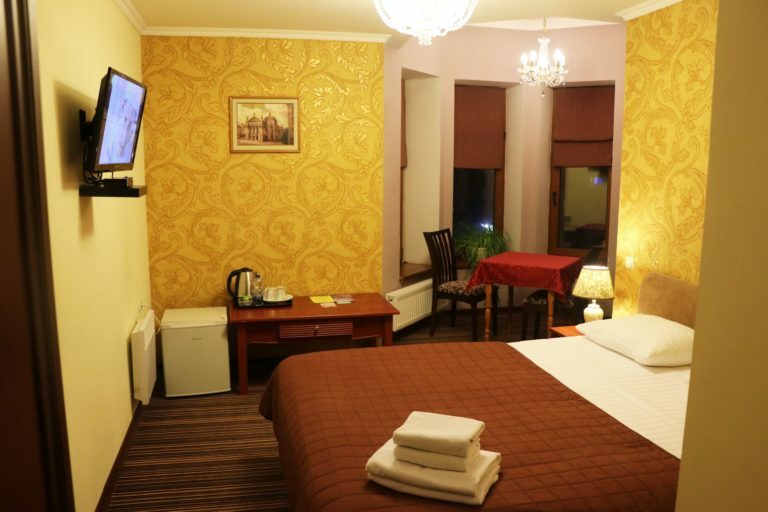 Our cozy hotel is located near the center of Kyiv in a picturesque and ecologically clean district Holosievo, which is known for its famoues parks, clean air, developed infrastructure and positive people. Excellent service, fine cuisine and kofort our accommodation facilities will make your stay truly memorable! With elegant and classic design hotel complex “Lavilia” is the ideal place for family holidays, as well as for corporate events, weddings, banquets and other celebrations. At your service – three first class banquet halls, from which you can choose the one that fits you best. First – Fireplace (40 persons) – is a place that combines tranquility and cosiness, the second RED Palace Hall, where you can feel the true aristocrats, and the third, which has 90 seats Ballroom – the perfect choice for any special events – banquets, receptions, banquets and balls. Here, in a whirlwind of dance can freely circling 75 pairs. The spacious rooms, elegant interiors, exquisite table setting, impeccable service and cuisine notch chefs – all of which will emphasize the importance and exceptional events. Interior hotel and restaurant designed in bright colors, all rooms have completely different styles, but all are equally good tune to peace and joy. At your service – 40 rooms of different categories – from comfortable standard rooms to luxury wedding luxury apartments. Hotel complex “Lavilia” offers a wide range of entertainment for every taste: Finnish sauna, massages, theme nights and cooking classes! OFFER OF THE DAY Relax DAY: -30% for the sauna and massage when booking this room! Double bed, table, two chairs, closet, TV, toilet, washbasin and hydromassage shower. Extra bed. The cost of breakfast is 100 UAH. per person (buffet breakfast). Quiet place. Beautiful landscape. Cozy rooms. According to family. Breakfast is good. Home kitchen. For good friendly company. Just got back from this hotel, I did not want to leave! Excellent Service! Individual approach to the customer, excellent food for all tastes, has booked for September, I would recommend to anyone who goes to Kiev for the first time in this hotel! The hotel is excellent, warm and clean. Breakfast is hearty. helpful staff. Came from Kherson, rest 4 days, I enjoyed it. Staff thanks for waters. Lavilia boutique Hotel is cozily situated in the heart of Kiev’s most prestigious and beautiful district – Goloseevo. From here, you are just steps away from shopping in utterly fashionable trade centers like Metro and Epicenter, tasting the best of our gourmet cuisine, exploring locations of historic importance, and simply immersing into the atmosphere of unmatched luxury, excellent treatment, and positive impressions – this is what Lavilia, a ritzy, yet budget-friendly, Hotel in Kiev, never fails to deliver. Blending European graciousness with Ukraine hospitality, Lavilia is the ultimate choice for everything, from comfortable accommodation and entertainment to special events and meetings. Lavilia is not merely a brand name but a synonym for first-class service, glamour, and style. Whether it is a business trip or a holiday break from reality, our hotel can offer you a stay unlike any other in Kiev. Proposing the luxury of upscale hotels and prices of inexpensive inns, Lavilia is the perfect variant to book hotel in Kiev, and for a good reason. Renovated, lovely-styled rooms and suites boast a mixture of unrivaled elegance, posh furnishings, and spectacular views of the Ukraine capital. Free car parking for hotel guests and spa center clients to keep your vehicle watched and protected while you are away. Personal Concierge would be happy to plan, execute, and personalize your stay with us, be it individual or corporate. Complimentary Wi-Fi Internet and phones throughout the hotel will enable you to stay in touch with the whole world. Day and night in-room dining service to enjoy culinary delights from our haute restaurant at any time. Access to a spa room and sauna where you can indulge yourself with relaxing, very pleasurable cosmetic procedures and unwind after a long day. Complimentary airport shuttle and car offering services give you an opportunity to get to any point of the city with ease and comfort. Modern conference hall that is equipped with everything it takes for a productive business. Landry, shoe shine, and cleaning services will help you look impeccably. Never intrusive, highly-trained staff would eagerly satisfy any of your demands and provide you with a hard-to-forget experience through flawless service. Fascinating buffet breakfast supplying both European and national culinary delights will make a right start of the day. A magnificent inner yard with a barbeque zone for rent allows you to spend time in a tranquil place, relishing freshly-prepared grilled foods. If you are looking for a cheap, still, sophisticated venue to stay in Kiev, Lavilia is an option you cannot go wrong with. Designed with travel needs in mind, Lavilia invites you to experience the joy of a luxurious residence with the treatments of a 5-star hotel! Do not hesitate to use our early booking gift to enjoy a stay in a trophy hotel with a 20% discount.